Guardian Protection Services is an award-winning security company that provides smart home security and monitoring services to residential and commercial customers. The company prides itself on being a small company with high-end services, though its services are not available in all states. 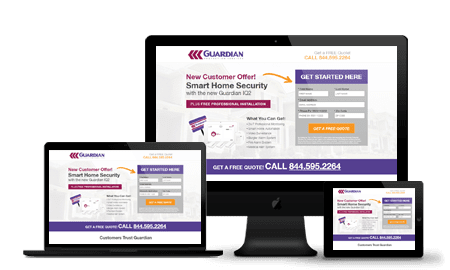 While it may not be a very large company, it has a long history (it was founded in 1950), and therefore Guardian is a reliable choice for home security services. According to Guardian Protection, the company has over 250,000 customers and has won numerous awards, all of which are listed on the company’s website. This entry-level package comes with wireless and cellular, a free mobile app, and a limited lifetime system repair. The equipment it includes is a color touchscreen control keypad, 3 window/door sensors, and one motion sensor. This mid-range package Includes all the features of the Essential package plus one of the following: door lock, thermostat, 2 light modules, or a garage door switch. The comprehensive home security system comes with home automation and includes the features of the Edge Control package, plus 2 additional door/window sensors and two indoor Wi-Fi security cameras with night vision. You also get the choice of one home automation device. Guardian offers fixed-rates 60-month contracts and a “Family of Guarantees” to protect your investment. Guardian offers a variety of security and alert options for complete home security coverage. Guardian Protection offers 24/7 monitoring, which means that customers can get in touch with a live operator by using any emergency button in their keypad. In addition, the company’s monitoring centers work even when no one is home, by tracking sensor alerts that may indicate a fire or intruder and notifying customers and the relevant authorities. The monitoring center works around the clock, 7 days a week and ensures a response to any emergency signal within 30 seconds or less. There are different types of alerts possible with the Guardian Protection system. The most obvious options are alerts that indicate a fire or burglary is taking place. The burglar alarm system features sensors to detect unusual activity, a yard sign to display to potential intruders that the area is being monitored and may feature indoor and outdoor cameras for video surveillance. Anything detected by the sensors creates an alert that is then investigated and addressed by Guardian Protection. The fire and medical alarm system work when customers are home and away and may include heat, smoke, and carbon monoxide detectors. All of the sensors and detectors are monitored 24/7, to ensure a fast response when an alert is created. Personal medical alert bracelets allow customers to trigger an alert by pressing a button. A wireless remote is used to arm or disarm the system and as a panic button if needed. Guardian’s proprietary software, Guardian Edge, helps you manage and control all aspects of your home security system. You can control your home’s lights, locks, thermostats, and garage door via your smartphone, tablet, or PC anytime and from anywhere in the world. For example, you can arm and disarm your alarm or even lock or unlock your front door using Guardian’s app. You can also see what’s going on in your house via the app if you have security cameras installed. The centralized dashboard is simple to navigate, and you can call emergency services with a single press of a button. Setting up and personalizing your home automation locks and arming schedules is easy to do for even electronics novices, and using the app to connect to your devices is simple and straightforward. If customers need to speak with a support representative, customer care hours are Monday to Friday, 6 am to 12 am EST, and Saturday and Sunday, 7 am to 12 am EST. This is not for emergencies, as the monitoring and response team for emergencies is available 24/7. Customers can log into their account on the Guardian Protection website to pay bills, view payment history, contact support for any questions, plan a move, and order more products. There is also an FAQ section on the site, and resources where customers can search and download manuals for the system and its components. Phone support is available Monday - Friday between 6am - 12am EST, and Saturday - Sunday from 7am - 12am EST. Customer support is available by entering your info one a contact a form on their website. There are video tutorials available on YouTube. A FAQ section on the website offers tips and basic information. Overall, Guardian Protection offers comprehensive security services that cover what most residential and business customers need. Customers praise Guardian Protection’s easy sales process, reliable equipment, fast response times, extensive awards, and reliability. Guardian Protection is able to compete with the big dogs in terms of sophisticated equipment, cutting-edge technology, and professional installation services, and it also offers a landline option to act as a backup to their cellular feature. While their customer service may not be top notch and its services are only available regionally, Guardian is still a reliable choice for customized home security systems and services that you can rely on 24/7 to protect you and your family.